Discover how to stop the pain from carpal tunnel syndrome! Whether you want to (1) get rid of the pain, (2) heal the inflammation, or (3) prevent carpal tunnel syndrome in the first place, this audiobook will teach you everything you need to know. Would you love to have pain-free hands? Get at the root cause. Find out what sets off the painful inflammation and learn to deal with it the right way. Discover proven, practical solutions to reverse carpal tunnel syndrome. Discover easy-to-use all-natural foods and supplements that can relieve the pain and set the healing process in motion. Learn therapeutic movement and massage techniques. Get information about recent medical advances in pain alleviation and find effective natural sources of pain relief. Once you have removed the sources, you can ramp down the inflammation itself. From natural remedies to pharmaceutical and therapy-based solutions, this audiobook provides treatments that have been proven to work for many people. If you perform hundreds of repeated movements with your hands each day, you are at risk of developing carpal tunnel syndrome. However, there are things you can do - without endangering your job - to protect yourself from ever experiencing this painful inflammation. I have included a number of easily adopted minor lifestyle adjustments, which add up to powerful protection for your body. Some of them can even increase your overall productivity! You can beat carpal tunnel syndrome! Stop suffering: buy it now! McCloud shows that carpal tunnel can be treated with his different techniques. He offers tips on relieving the pain through massaging the right spots. He also explains what medicines and home remedies work the best for treating carpal tunnel. Finally, he explains the causes of carpal tunnel and shows you what you can do to help prevent it. I feel weird giving 5 stars to a book that's a little over half an hour but he packs the minutes full of useful information rather than simple dialogue. it really gets going when he mentions the first piece of technology and I really like his personal strategies at the end. this book convince me that I don't have carpal tunnel at least for the moment but I have other things that his information is useful for I believe. it's also nice to be able to finish a book in one sitting since it helps me not to procrastinate I look forward to seeing if his other books are of the same or better quality. Really great book to help you treat carpal tunnel! Would you listen to Carpal Tunnel again? Why? Yes, this book has a lot of really good information to help you overcome symptoms of carpal tunnel. Yes, this one matches up quite great with the quality of his previous work. His tone and clarity of voice is really good! No, there was no particular moment in this book that moved me. I really like the amount of information contained in this book which can help lead you in the right direction where it concerns curing symptoms associated with carpal tunnel disease. if you are suffering from symptoms of carpal tunnel disease then this is the book for you. I would highly recommend this title to anyone who need help with curing carpal tunnel disease in an effective way. This title lists simple steps which can help you find the right way to cure your carpal tunnel disease symptoms. If you are wondering if you should read this title or not I would recommend giving this book a try! Do you have carpal tunnel? Do you have pain in your wrists? Try this book about carpal tunnel and relieve some of the pain in your hands and wrists. There are so many ways to relieve the pain and even prevent you from getting carpal tunnel in this book. I have changed my typing habits and my hands feel better already. This book will give you all you need to know about Carpal Tunnel syndrome. from the overview, causes, diagnosis, management etc. you name it. Listening to this book was very educating and it opened my eyes to something i have been ignoring all along. Carpal Tunnel - take care of your hand! 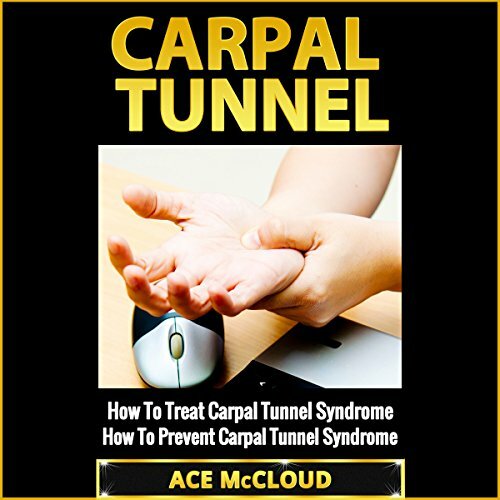 ‘Carpal Tunnel’ by Ace McCloud is a very good guide how to treat carpal tunnel and how to looking after at your hand. I have never notice that writing a lot and using computer mouse can be harmful for my hand and overall health. One day I realize that my hand is swelling and can feel very heavy. In my case just few days off from computer enough to recover. But it is worth to know that is symptoms like that persistent it is a red light. Ace gives very good description what is carpal tunnel and how its develop. It affect not only your hand but also spine and whole nervous system. Also gives an explanation of medical reasons of this problem. I especially like the chapter about finger and hand exercises that help you prevent carpal tunnel and others problems. Also good diet and nutrition guide is also provided as well as modern equipment like food pedal mouse or voice keyboard. Worth to know and practice. If concerned with your wrists, then this book is fantastic to give you some tips about how to manage your carpal tunnel syndrome. This is a great book to help someone diagnose and prevent the Carpal Tunnel syndrome. The explanation and the description of the syndrome can help you diagnose its symptoms and prevent it on its early stages. This way you can understand what can cause it and take action on preventing it. For example, choose the right chair to sit on while working on your computer or even choose the right mouse to prevent you from developing it. Natural remedies mentioned in the audio-book can also boost your health while keeping you away from such the syndrome. This can be a particularly frustrating and painful injury. This short audiobook contains some very helpful exercises and information on treatments and ointments that can relieve the pain. A good guide to simple techniques that anybody can put into place to prevent carpal tunnel syndrome from developing.